30 Causes of Dreams and Nightmares According to World Mythology #infographic ~ Visualistan '+g+"
Nightmares can be incredibly scary and mysterious, so it's no wonder that people around the world and throughout history have sought out explanations for them. 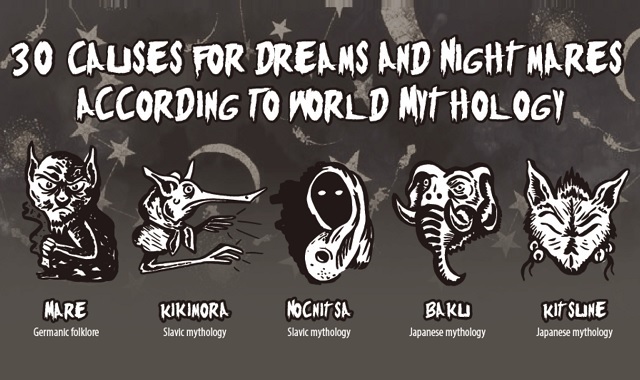 This infographic from Sleepopolis takes a close look at nightmare mythology from around the world, the means of nightmares in different cultures, and the nightmare creatures that plague your sleep! On this infographic from Sleepopolis, you'll find several creatures from many different areas, including but not limited to Japanese mythology, Slavic mythology, Germanic folklore, and English folklore. Take the Fylgja from Norse mythology, for example. It's an animal spitit whose fate is tied to a particular human being! Someone of nobility may have a bear fylgja, and someone who is cruel may have a wolf. Yet, if they witness the fylgja's death in their dream, it could mean bad news! Let us know what you think of this infographic from Sleepopolis!